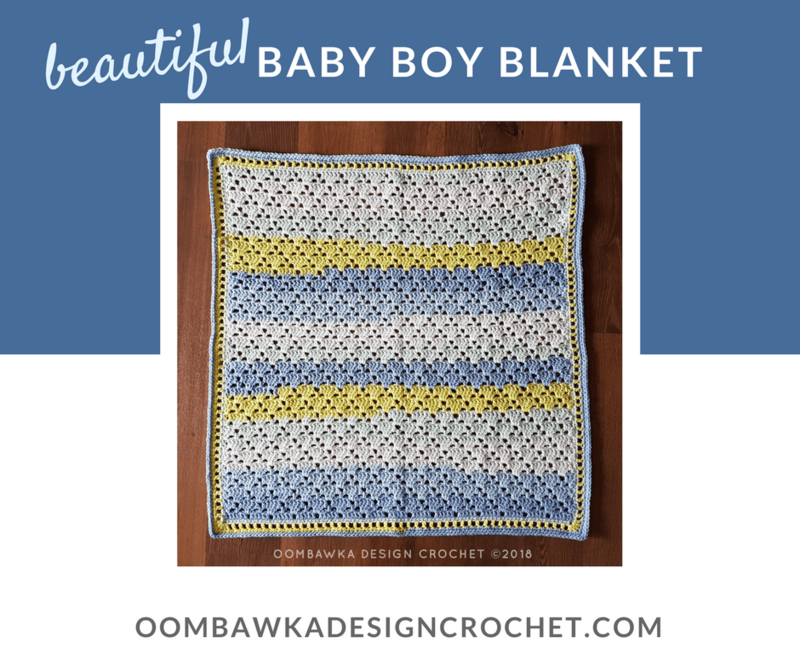 This post includes my Beautiful Baby Boy Blanket Pattern. What’s a girl going to do!? when her friend is expecting and isn’t finding out if they are having a boy, or a girl until the very last moment… well if you are me then you need to have 2 baby blankets on hand. I have decided this one will be for the baby if the baby is a boy. 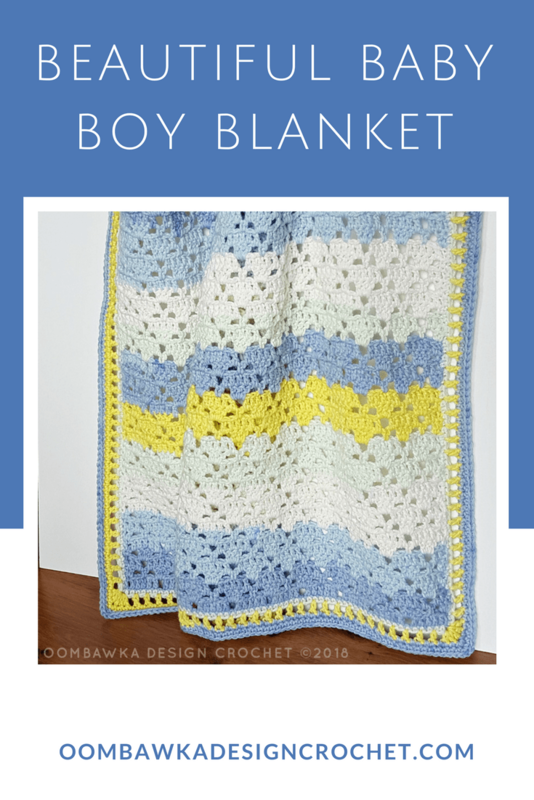 It will work perfectly for girls or boys though, just switch up the yarn colors to those the expectant parents prefer and crochet away. 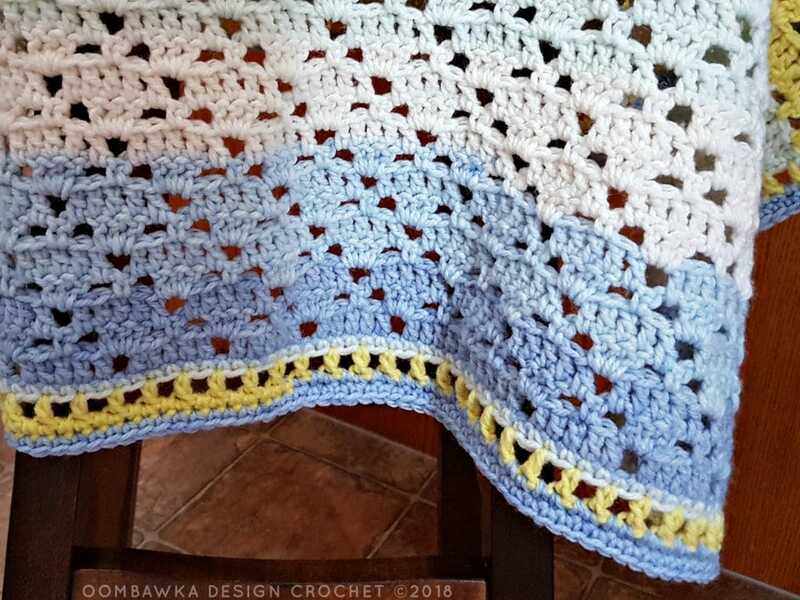 This project is easy to make and takes 627 yds of medium weight yarn and a 5 mm (H) crochet hook. 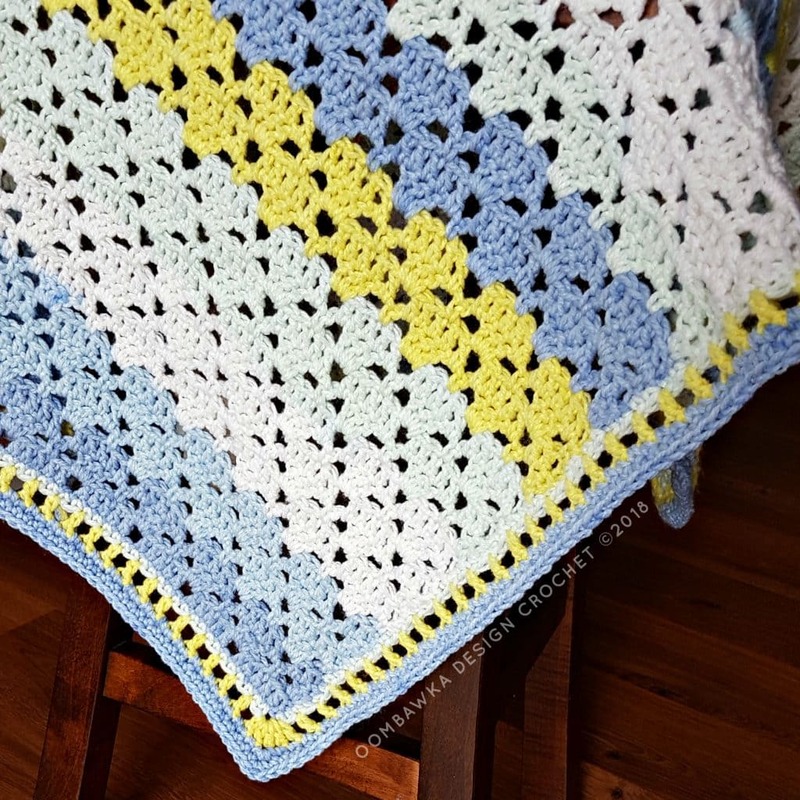 I chose to use my last 3 balls of Caron Baby Cakes yarn to make this baby blanket. I was able to buy some last fall before it ran out of stock at Michaels. 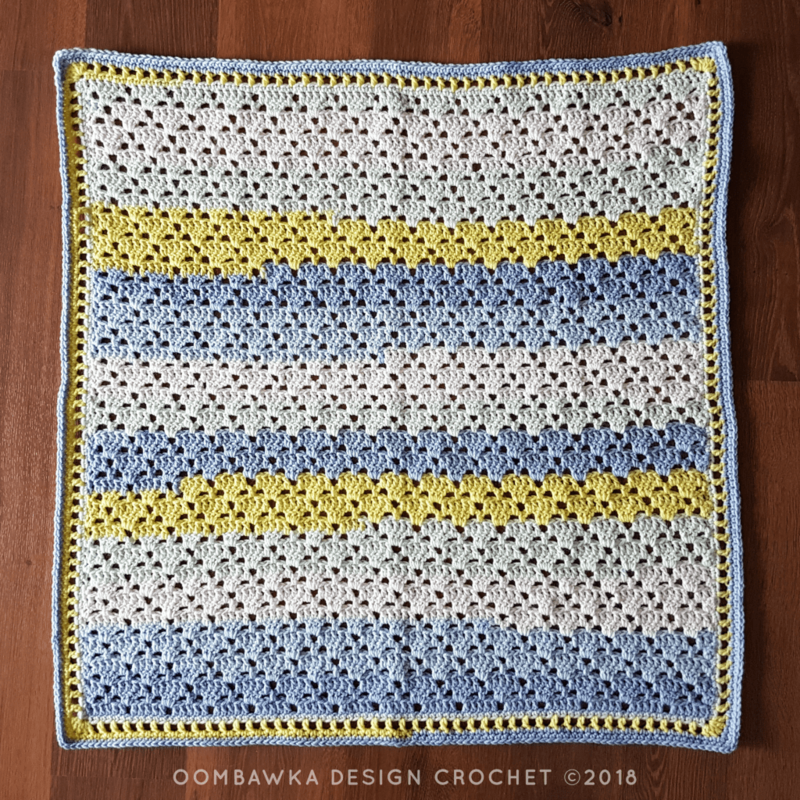 I hope Caron releases more of this yarn soon because it is absolutely gorgeous to work with and the colors are perfect for babies! Not to mention it is super soft and machine washable and dryable. I better get back to work and finish up baby blanket #2!! The baby is coming super soon! It is never recommended to leave baby alone with a blanket. Please take necessary precautions to keep baby safe. Yarn: Caron Baby Cakes. Medium Weight  Yarn. 3.5 oz / 100g ; 231 yds / 211 m. 82% acrylic and 18% nylon. Machine washable and dryable. I recommend working into the back bump of the starting ch to provide more stretch/elasticity to your projects first row. The initial ch 3 counts as 1 dc. This blanket is worked back and forth in rows. R6 – R57: Rep R2 to R5 in order. Do not turn after the final row. Do not finish off. Proceed to the Edging Rounds below. Rotate your work to continue down the side edge of your project. The edging is worked in rounds around the outside edges of your project. You do not need to sl st to join at the end of the round unless indicated. congratulations, this blanket is absolutely amazing ! I am french and the pattern is not always easy to understand so I wanted to know: what is the name of this beautiful stitch ?